In just a few short weeks the house will be full, the wonderful smells of good cooking will fill the home, lots of sounds of children playing, people enjoying conversations and of course, the sounds of football coming from the tv. One thing I can do days in advance is get the Thanksgiving table ready for company. I love to find new ideas to use and here a a few I found. I love rustic and natural table settings. Wood, wildflowers, twigs and other items from nature make a beautiful table setting. 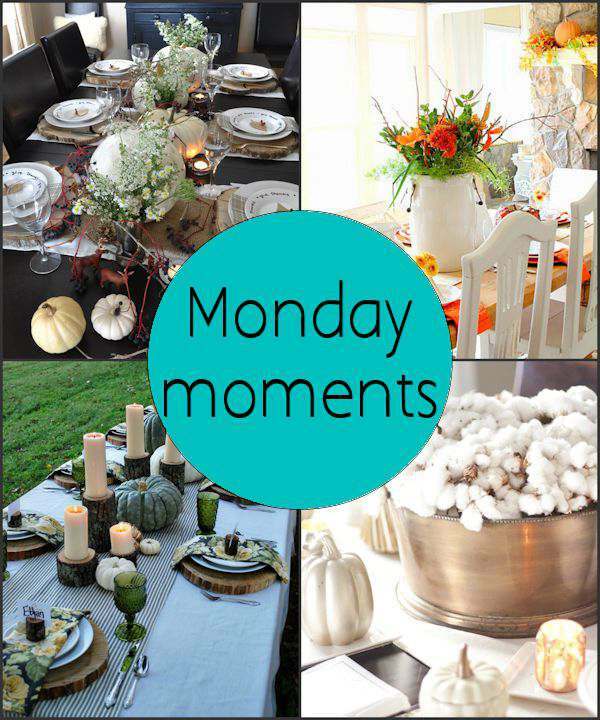 Life is a Party has a beautiful table to get ideas from for that neutral setting. I love how just a bit of color in this table setting is so eye catching. Duke Manor Farm calls this table setting “simple” and I must agree. I love the large crock with bright flowers as a center piece. Have you ever thought about having Thanksgiving outside? I know most of the country couldn’t, but what a beautiful setting this table is in nature. The White Buffalo Styling Co. shows us a beautiful example of how nature not only in the background, but on the table work. Gold and white for a perfect holiday table. Using wheat and cotton just makes my heart skip a beat or two coming from farming country. Just Destiny shows how to use natural items in an elegant table setting.